I really like these new hot pink hearts. However, I LOVE my vintage glass Christmas ornaments - they are a little beat up, maybe not quite shiny anymore, and look loved. So, I've had these hearts for awhile and kept complaining to Dennis that they look too new. Finally, after he figured out that he was not going to hear the end of it any time soon, he suggested taking off some of the color and exposing the underneath layer. Oh, that sounds smart! But HOW? Dennis first came up with paint thinner, but it is a little aggressive. Here's what worked: fingernail polish remover! 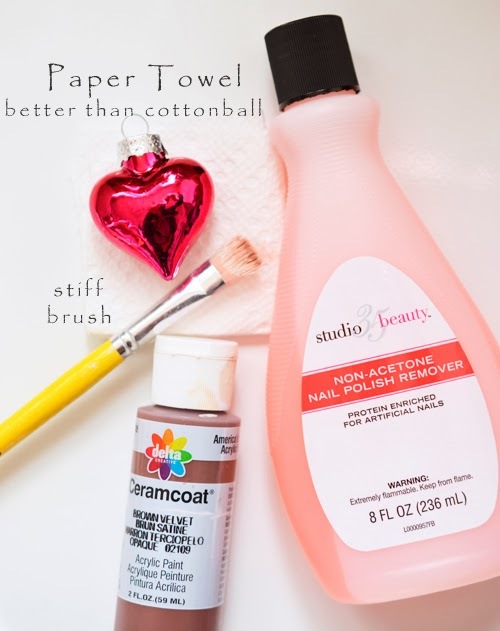 Fingernail polish, a paper towel, a little brown paint and a stiff brush. That works for me! The paint is to take the shine off the silver hanger on the heart. Use very little paint and wipe most of it off and then brush it on the hanger. Take off as little or as lot of the color as you like. 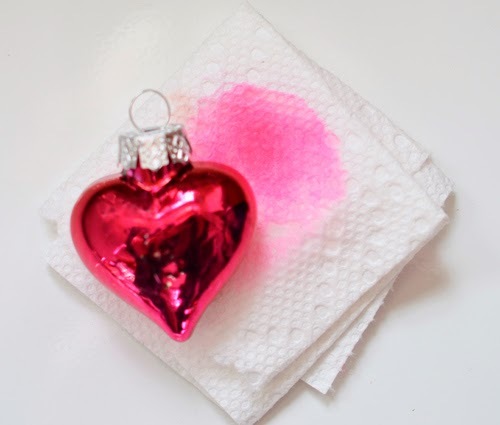 TIP: Press the paper towel (with nail polish remover on it) to the ornament where you want to remove a little color. Then give it a little rub - lightly. Repeat. If you compare the very top picture to the picture below, you can see that the above heart has more silver showing. 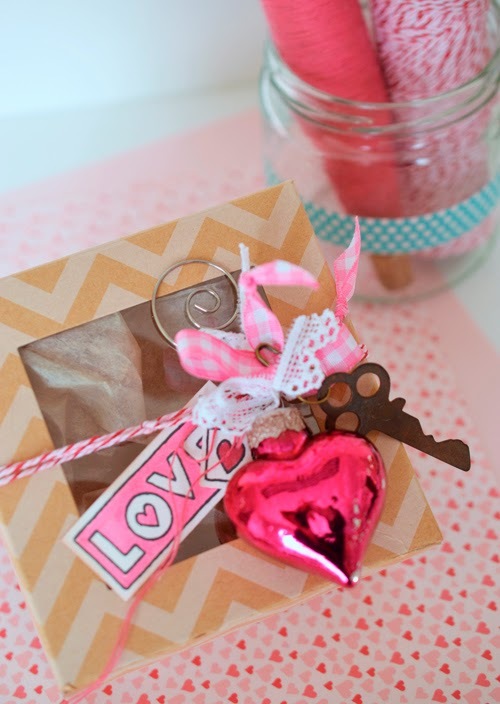 Decorate with a little ribbon, tags, and a vintage key. 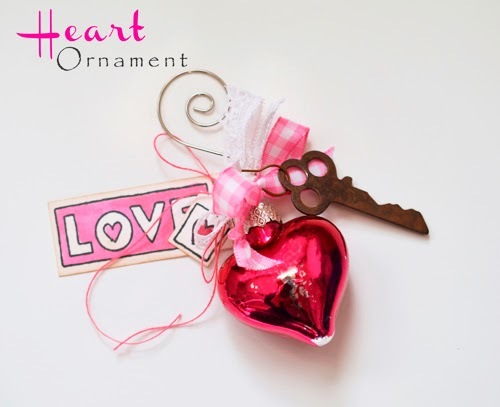 One great idea is to use the ornament as packaging - they get a gift and an ornament, too! To make it easy to remove from the box, I passed the twine through the ornament hanger and tied the twine at the back of the box. 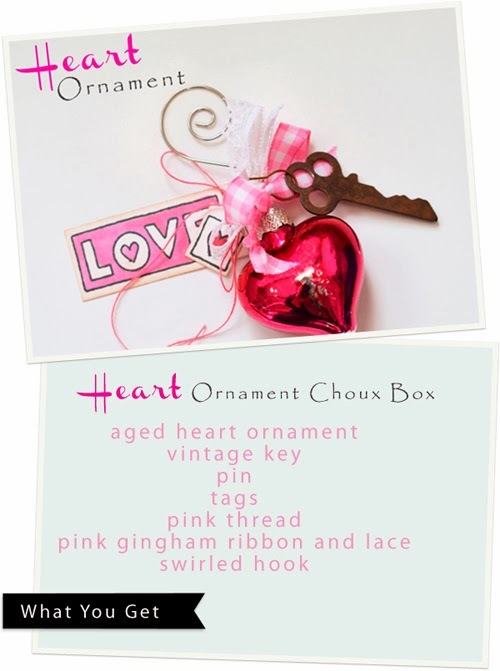 I've put together a very limited number of Heart Ornament Choux Box kits. The Heart Ornament Choux Box is available in my etsy store. In the comment section, mention that you saw this Choux Box on my blog and I'll include the box and twine in the above picture. Can I please just be a fly on your wall? I absolutely love everything you make. It's all got the perfect vintage charm to it! What a cool idea, who would have thought!! :-) Very creative! I too adore my vintage ornaments. And I have used polish remover on new things..but the brown paint idea is something new. Sweet box! Thanks for coming my way.